What Can You Buy Using TreasuryDirect? TreasuryDirect is best for those who plan to hold their bonds until maturity — selling bonds before they mature is more difficult and costly compared to other aspects of the service. Also, you can only buy new issues. Once a bond is trading in the secondary market, it is no longer available via TreasuryDirect. As a result, those who plan to trade would be better served to look elsewhere. 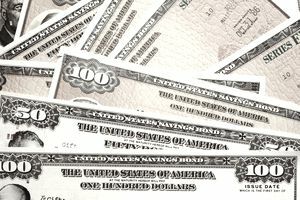 STRIPS, or zero coupon bonds, issued by the Treasury also are unavailable for purchase on the site. One of the primary attributes of the site is its ease of use. It makes purchasing Treasury securities simple, and it presents information in a clear, accessible form. From beginning to end, the process of signing up and arranging to purchase government bonds takes only about 10 to 15 minutes. The website requires you to input basic information, such as your Social Security number, e-mail address, and banking information. The purpose of the banking information is to allow electronic transfer between your bank account and your TreasuryDirect account. Once you are signed up, there are a number of options on what you can buy, how you can fund the purchase, and how you will receive principal and interest payments. TreasuryDirect also provides a Payroll Savings Plan, which enables investors to make recurring purchases of electronic savings bonds by having money automatically taken from each paycheck and sent to an account at TreasuryDirect. In addition to providing a way to buy government securities, the Treasury Direct website is also full of information that can help you learn more about the Treasury market and the debt operations of the Federal government. Among the useful features are the Treasury auction schedule and the results of recent auctions. One interesting — albeit frightening — feature is the page The Debt to the Penny and Who Holds It, which shows the exact amount of debt outstanding and allows you find out the specific level of debt on any day, month, or year dating back to 1993. The site also contains an explanation of the auction process, savings bonds rates, calculators, links to other government websites regarding the economy, and even a section for kids.